Pallet Central Enterprises (PCE) is your one stop shop for all of your pallet and dunnage requirements. Across town, in-house from plant to plant, or overseas, we provide the expertise to minimize your expense while conforming to interstate, intrastate, or international regulations. Our specialties are pallets and crates: new, used, recycled, custom, combo, plastic, Euro, CPI, can pallets, glass pallets, and ISPM-15 compliant. Pallet Central Enterprises also handles kraft paper, tier sheets, top frames, recyclables, pallet design, pallet management systems, closed-end or open-end logistic solutions, and trucking services. 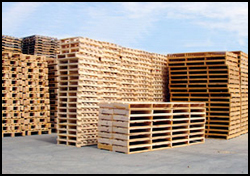 Pallet Central Enterprises will provide new pallets in standard or custom sizes to meet your shipping needs. Pallets are available throughout the continental United States, Mexico, and Canada. Please contact us for information concerning other locations. Please visit the Contact Us page to access our contact information. Recycled pallets for one time use or multiple uses are available. Various industries use different size pallets. If you have a need for GMA, Euro, Can or Glass pallets, we can supply them to you. Beverage, plastic, and other sizes are also available. We can even customize used pallets to your company specifications. For more information please visit our Green Fiber Division. Plastic pallets are manufactured in a variety of shapes and for a variety of uses. In-house use only for racking systems and sanitation. Closed logistic solutions where container manufacturers are shipping to bottling or canning plants. Pallet Central Enterprises works with companies to recover and return pallet equipment shipped under freight to distribution centers outside of their corporate umbrellas. Some examples include plastic, new wood packaging products, custom sized pallets, and so forth. By working with shipping and receiving corporations, costs can be reduced for both parties. JIT (Just in Time) solutions are available as part of a pallet management system. Pallet Central Enterprises assists with repair and recycling of in-house and closed loop systems. Closed loop systems are typical in the bottling and canning industries. We can recover, repair and return to corporations. Our customers experience reduced transportation and repair costs. JIT (Just in Time) solutions are available as part of a pallet management system. The NWPCA (National Wood Pallet and Container Association) supports and offers a Pallet Design System to their members. Pallet Central Enterprises has access to this system. Albert �Al� Longman is a board member of the Executive Committee of Recyclers Council for the NWPCA. Benefits of the pallet design system include the designing of your pallet to reduce costs by not over-engineering or under-engineering your pallets. Material usage and analysis include racking, floor stacking, and other deflection points, and can help reduce any hidden costs in choosing the correct pallet for your application. Additional information is available at National Wooden Pallet and Container Association.